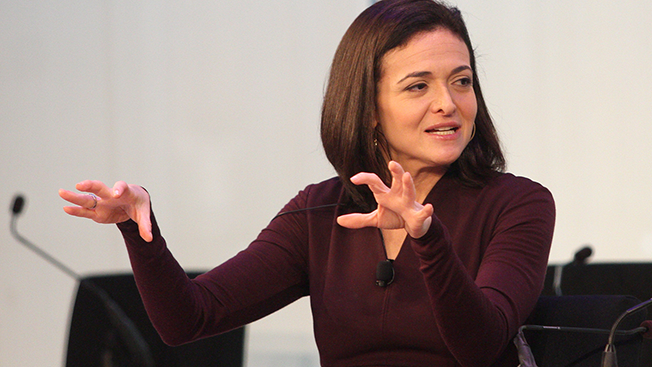 Facebook's chief operating officer Sheryl Sandberg made it clear to media buyers during an Advertising Week session in New York today that video is big business for the platform, and it's not afraid to go after big brands' TV budgets. During a discussion with Bloomberg's chief content officer, Josh Tyrangiel, Sandberg heavily played up how Facebook is at least a complement to (if not a replacement for) television advertising. But, as brands invest more in video on the social platform, Sandberg acknowledged that marketers are concerned about what they're paying for and how it's measured. "What people are starting to understand is that what we offer is really broad reach—we have a Super Bowl on mobile in the U.S. every day," Sandberg said. "Our data says that if you do TV plus Facebook, you enhance your reach by 17, 18 percent and more than double that for millennials, which is a hard group to reach right now on TV." When Kellogg's Eggo, for instance, brought back its iconic "L'eggo my Eggo" campaign last year, it ran a video ad targeting Facebook users shopping for frozen foods. While Facebook was only part of a bigger media plan, Sandberg suggested that the Facebook-specific creative increased Eggo's sales by 2 percent. "If you look at most big campaigns, what you'll see is that [brands] do Facebook, Instagram, TV—a lot of them still do outdoor and print," she said. "But all of these things really work together if you tailor your message and the right audience." Still, selling brands on digital media is no easy feat which is why Facebook is exploring new ways of selling and measuring video ads. Buying digital media is particularly challenging for Facebook's target of big-brand advertisers who have bought TV ads the same way for decades. To ease brands into buying more digital ads, Facebook this week launched TRPs (target-rating points), which use the old-school practice of having media buyers call Facebook reps to purchase campaigns. To pull in even more more money from video, Facebook is experimenting with different ways to charge for ad impressions, including a 10-second view and a 100 percent viewability guarantee, even though Facebook says buying impression-based ads works well. "We still sell a lot of our ads via impression, and we have a lot of data that says that the first impression is really, really valuable," Sandberg said. In terms of other types of video, Sandberg said, Instagram's self-service ads are rolling out in the next two weeks, letting brands leverage Facebook's granular data to target them. There's also Occulus Rift and virtual reality, which Sandberg said "is the future" but is also years away from gaining mainstream traction.